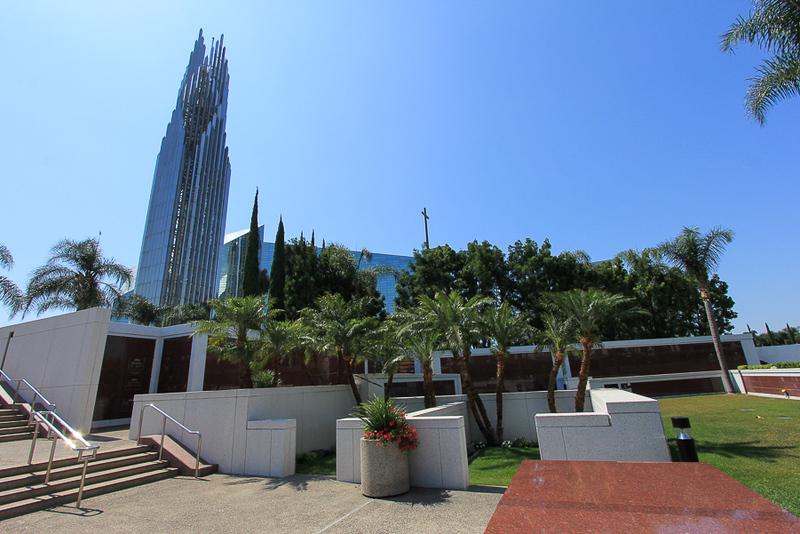 June 29, 2016 - Today we drove down to Garden Grove in Orange County to see the 34-acre complex now known as Christ Cathedral. 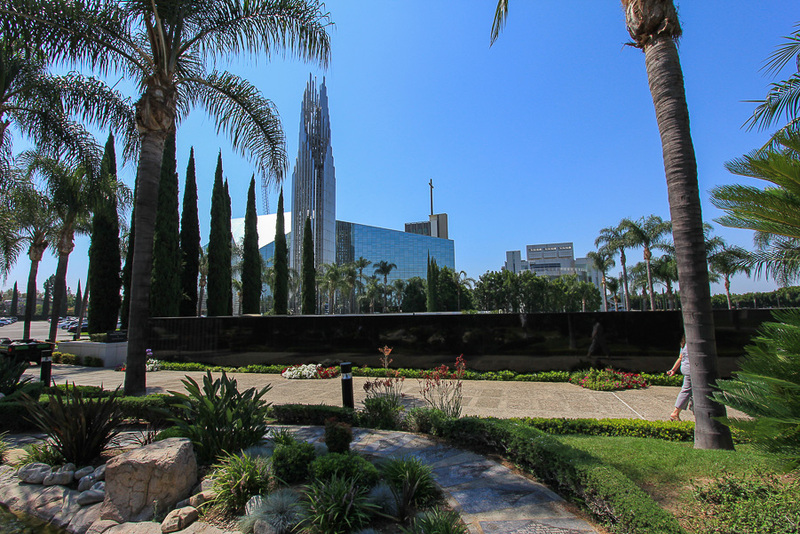 The cathedral, formerly known as the Crystal Cathedral, was built in 1980 and is the largest glass building in the world. 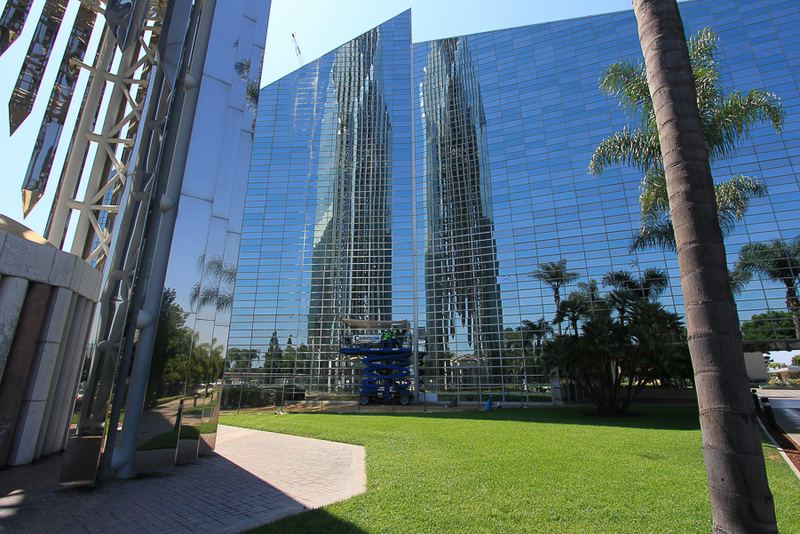 The former Crystal Cathedral was synonymous with Rev. Robert H. Schuller and his “Hour of Power” television evangelist show. 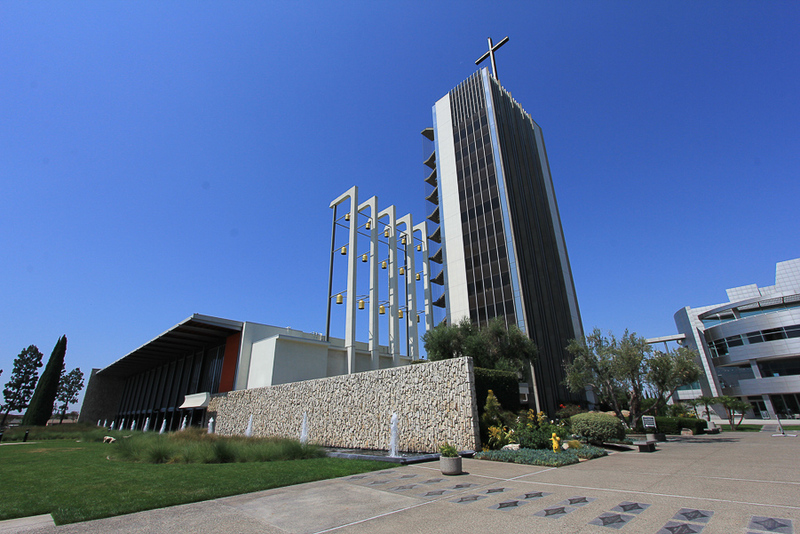 His ministry went bankrupt in 2012 and the buildings and grounds were purchased by the Roman Catholic Diocese of Orange. It is absolutely breathtaking. 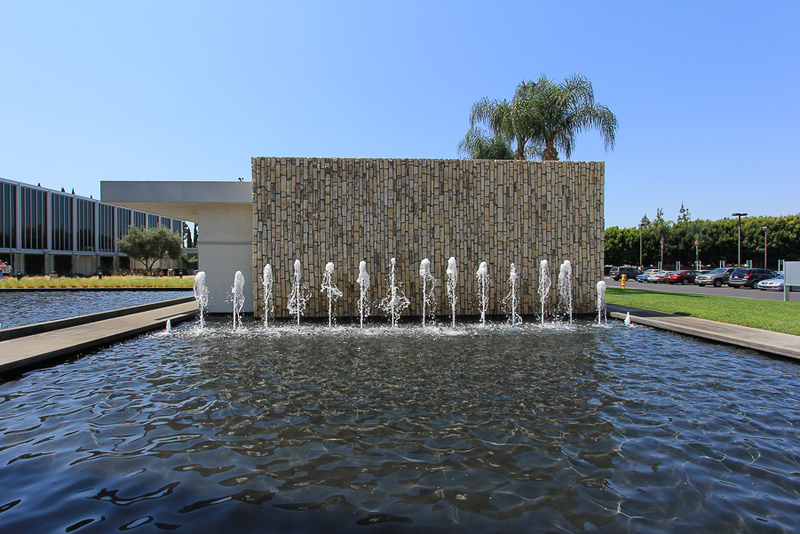 When the complex was first begun in 1961, the original buildings were designed by Richard Neutra, an Austrian-American architect based in southern California and considered among the most important modernist architects. 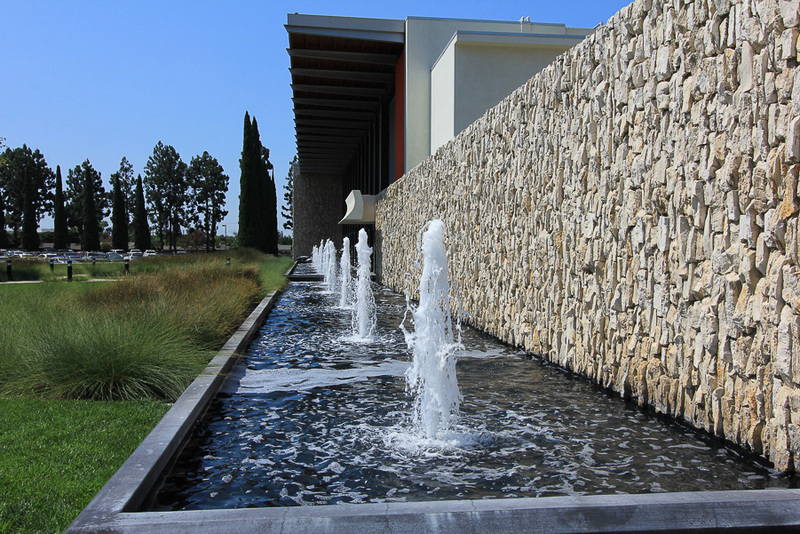 As buildings were added over time, they kept to a post-modern expression of Neutra's original design concepts. 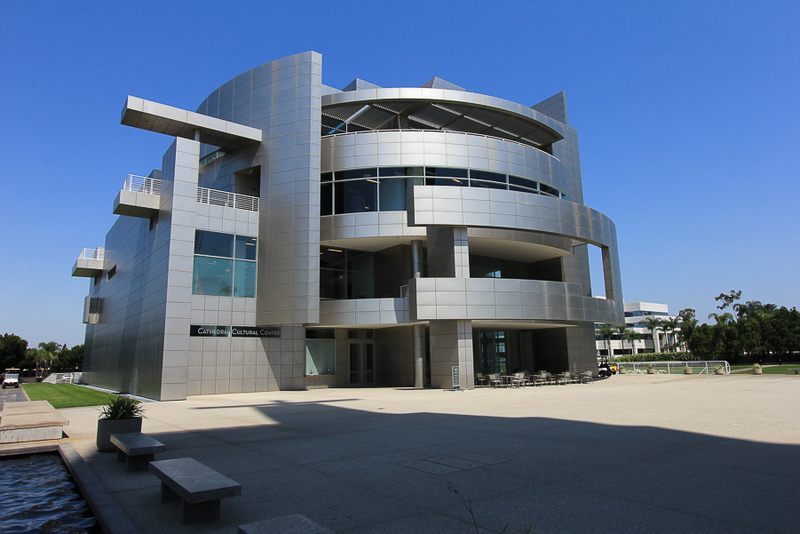 The first building that we saw is the Cathedral Cultural Center designed by Richard Meier in 2003. 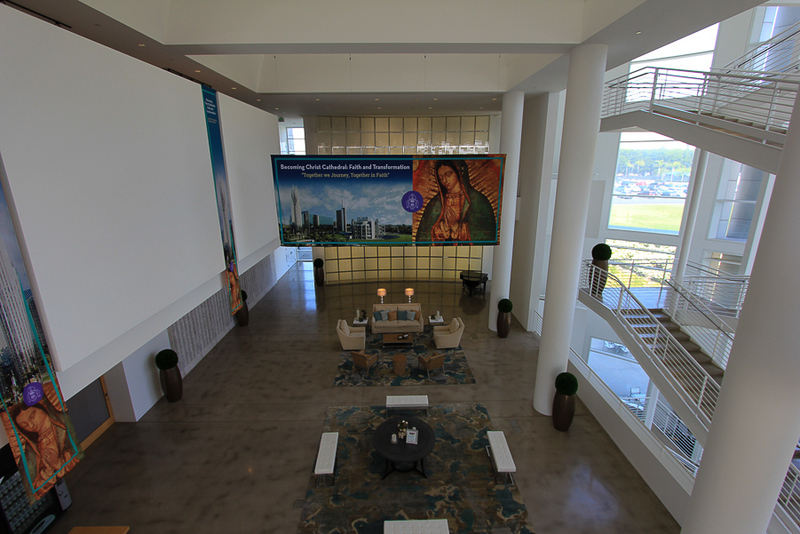 This picture taken inside the Cultural Center shows a wall of glass behind the banner hanging from the ceiling. 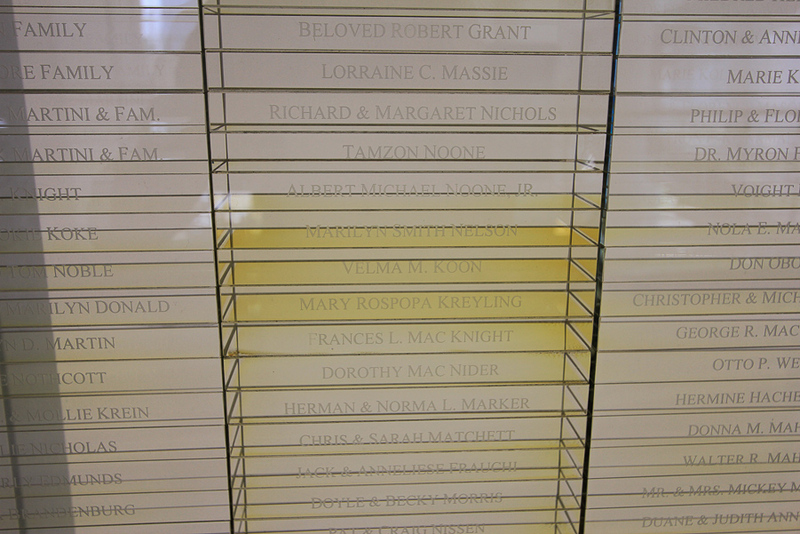 The glass is made up of tens of thousands of names of people who donated to Rev. Schuller and his ministry during one of his fund raising campaigns. 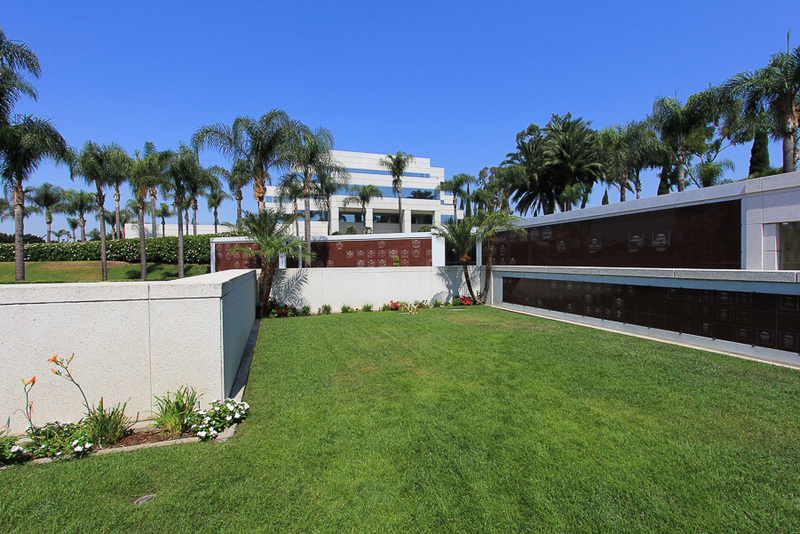 In total, we were told, that this wall represents the $10 million pledged to Rev. Schuller and his Hour of Power for this particular campaign. 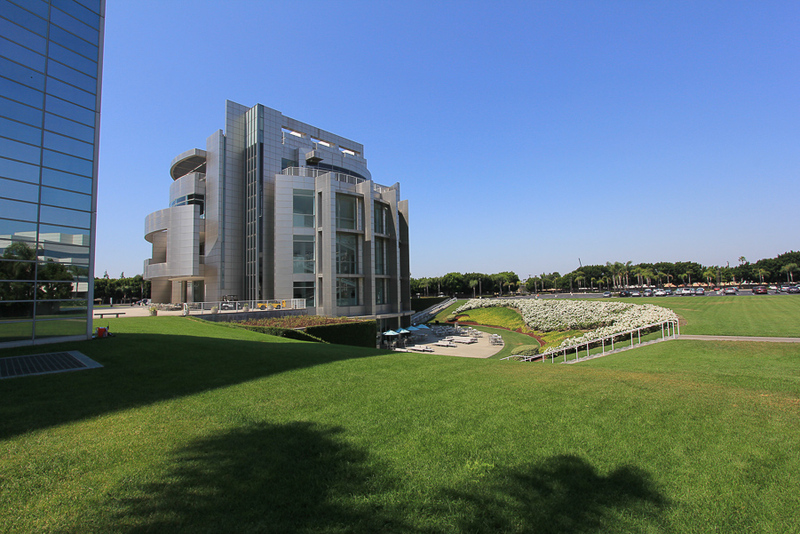 This is the Pastoral Center and Christ Cathedral Academy, which was designed by Gin Wong in 1990. 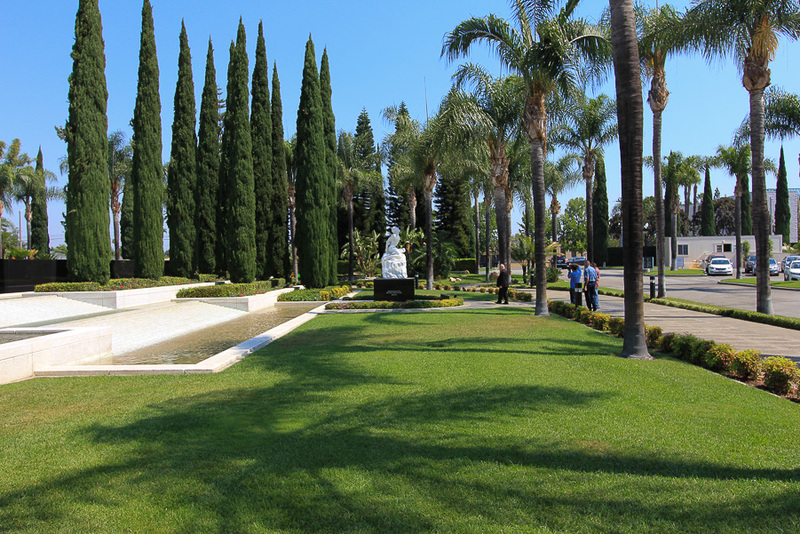 Next to it is a cemetery that is called the Cathedral Memorial Gardens. 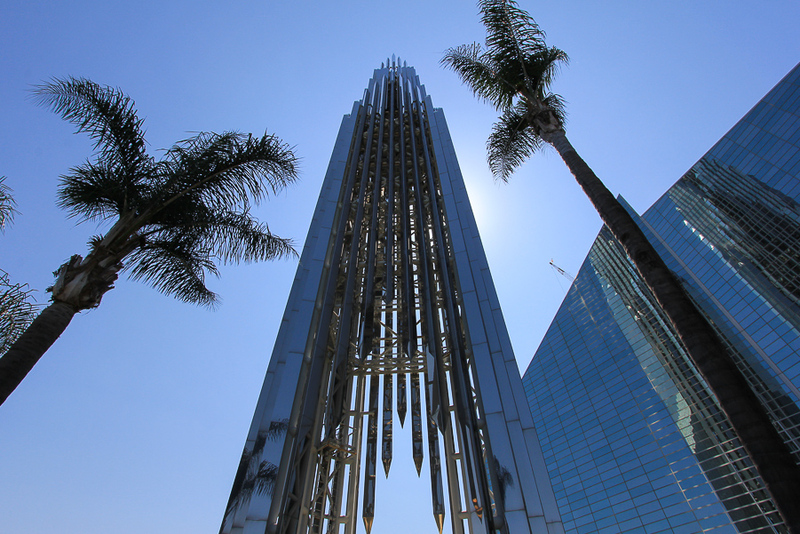 The Crean Tower was designed by Philip Johnson in 1990 and is a 237 foot mirrored spire housing a 52 bell carrion. 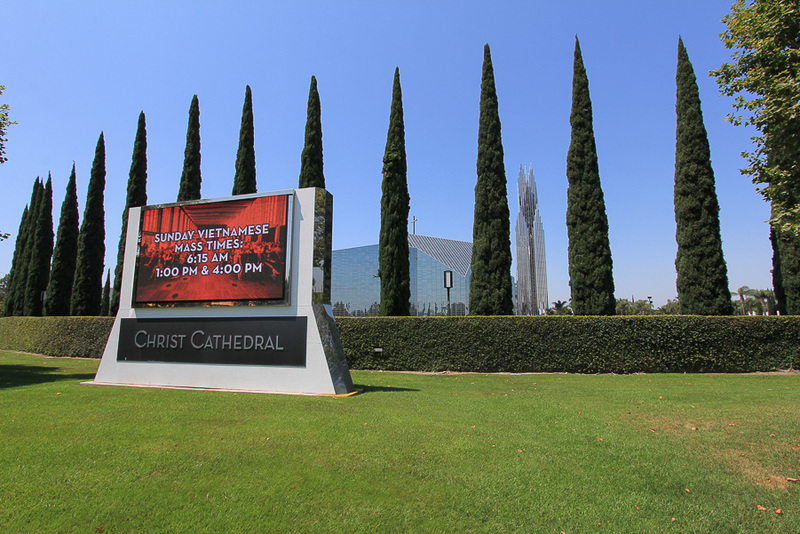 The Christ (Crystal) Cathedral was designed by Philip Johnson in 1980. 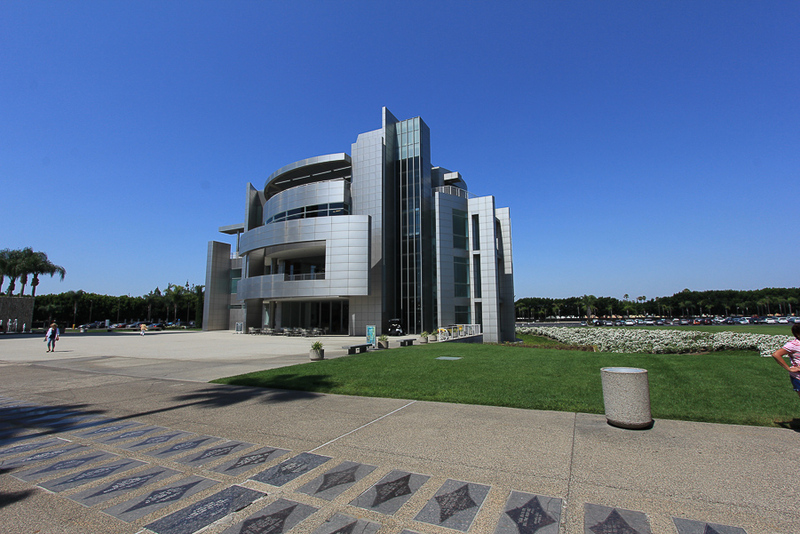 It is about 80,000 square feet and is made entirely from steel and glass. 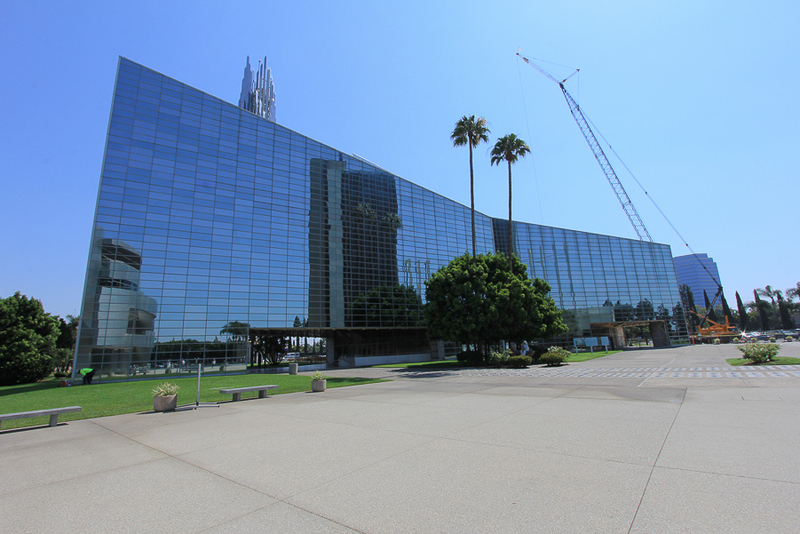 With more than 10,000 panes of mirrored glass it is known worldwide for its beauty and awe inspiring scale. 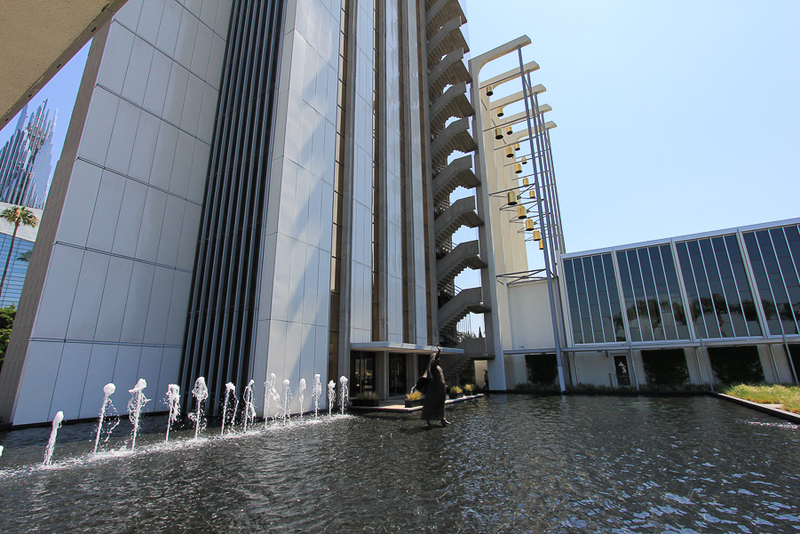 The Tower of Hope was designed by Richard Neutra in 1968 and was the tallest building in Orange County at the time. 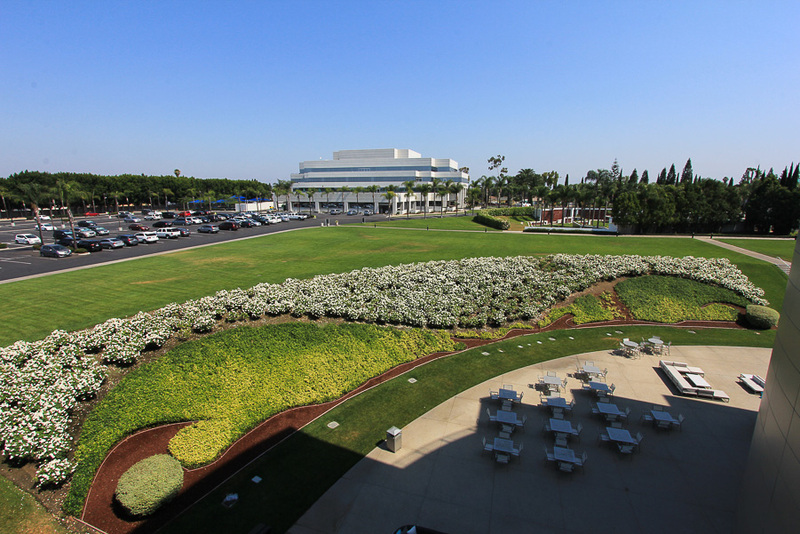 The building to the left of the tower is the Arboretum, which was also designed by Neutra in 1961. 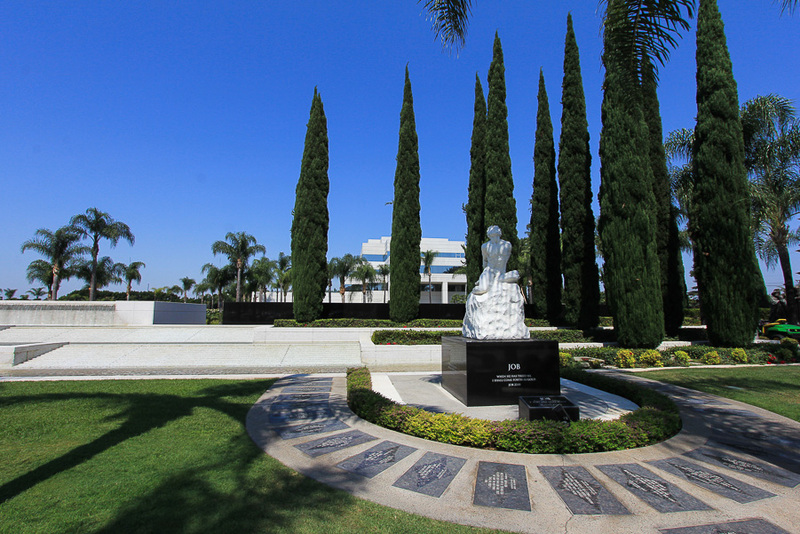 It served as the original sanctuary space for founder Robert Schuller's congregation until the Crystal Cathedral was completed in 1980. 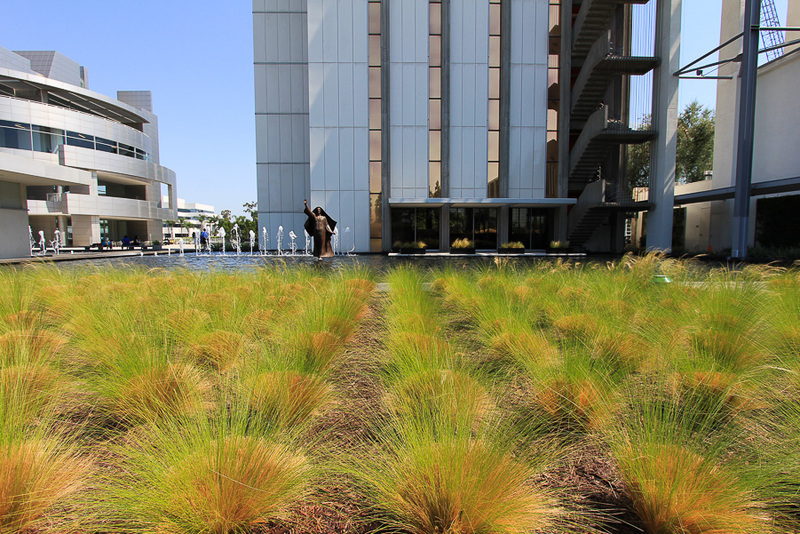 The pictures can't convey the impact of the complex like a personal visit does. It is a magnificent project. 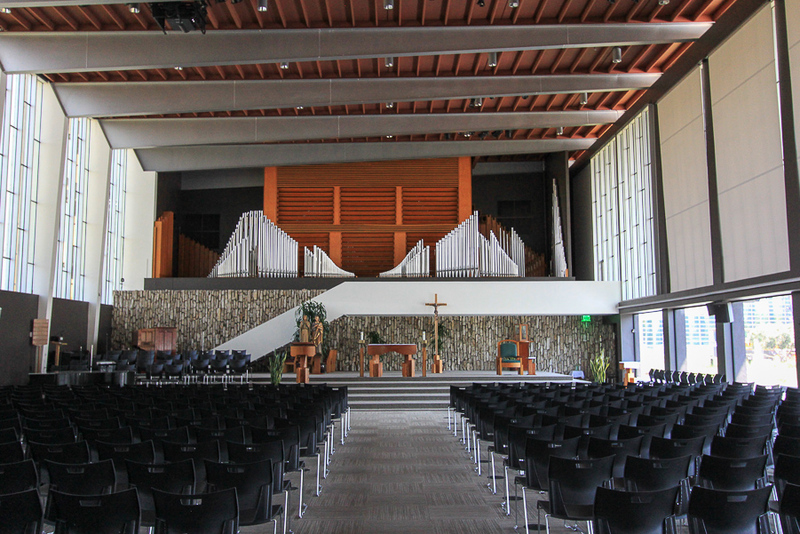 The cathedral is currently undergoing extensive renovations and the interior has been completely gutted. It may take another 4-5 years before it is fully completed and we plan to return at that time. 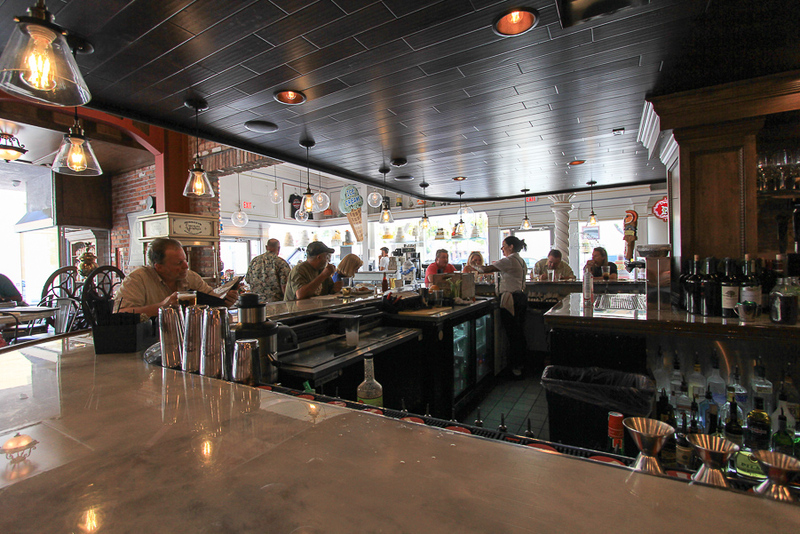 After our tour we drove to downtown Orange for lunch at Watson's Soda Fountain & Cafe. We both had their fish and chips and the chips were unique. They were sliced potatoes but about 3-4 times as thick as a potato chip. Then they were covered with the same batter as the fish and everything was deep fried together. It was especially sinful since we just toured a cathedral.